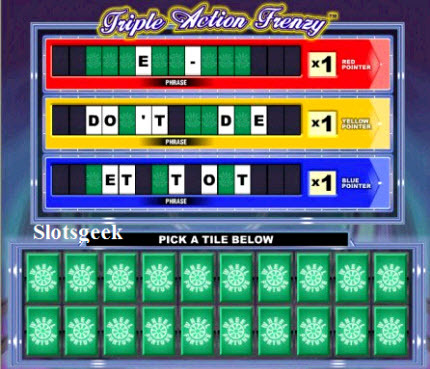 Triple Action Frenzy Wheel of Fortune Slots certainly has the potential to leave the player with more than enough money to buy any vowel they may choose! This slot has great built-in bonus games and allows those who like high rolling to bet it all during the course of game play. The symbols on Triple Action Frenzy Wheel of Fortune Slots are easy to read and clear in their meaning. The wild symbol has the word "Wild" written across it, for example. 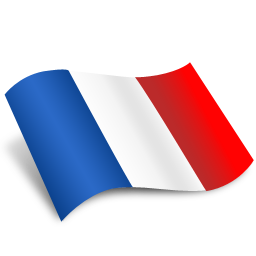 Other symbols include fruits and images of applauding players. The bonus feature of this game allows players to engage in play very similar to the wildly-popular television show. There are opportunities to win very big in this game. There is no autoplay feature in Triple Action Frenzy Wheel of Fortune Slots. There are some time-saving convenience buttons, however. This game does allow players to make the maximum bet with the press of a single button. Bets may be increased incrementally by clicking on the "Bet One" button until the desired sum is reached. There are 5 reels and 15 lines on Triple Action Frenzy Wheel of Fortune Slots. Players may bet on as many or as few as they like with the maximum bet being 5 credits against any available line. Lines are chosen from an interface which lights up the applicable line as it is chosen. Line choices must be consecutive numerically. Any bet will be equally distributed among the lines chosen so $10 on two lines will constitute $5 on each line for payout purposes. Triple Action Frenzy Wheel of Fortune Slots is all about the bonuses which can greatly increase one's winnings. If one is fortunate enough to have five Super Wild symbols appear on the middle line, there is a series of envelopes presented. Choosing from these envelopes can introduce a multiplier of 2, 3 or 5x to one's winnings! The Triple Action bonus round is the definitive feature of this game. During this bonus game, players engage in the same puzzle-solving style game play that characterized the game show. They may choose letters and some of the letters reveal free spins. There is a chance to get a Wheel icon from amongst the tiles which opens up the game of the same name. 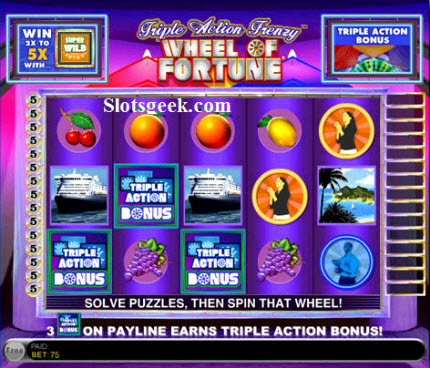 Triple Action Frenzy Wheel of Fortune Slots is one of the most popular games around today. The bonus features on this game are a good part of that popularity.